The IIFA 2015 Awards show being held in Kuala Lumpur, have been an impressive display of Bollywood dance, music and entertainment. The second day of the show in Malaysia brought in a new element – fashion! The hosts of the June 6th fashion extravaganza were the cheeky Vivek Oberoi and the beautiful Neha Dhupia. Being an evening high on style and glamour, could we expect anything less from our host? Nope. Vivek looked dapper in a black and dark blue ombre suit by Rocky S while Neha wore a fun print Neha Agarwal separates from her Spring Summer 2015 runway collection. We had our eye on Neha’s creations for a while now, especially this yellow print skirt. Needless to say, we are mighty pleased. Ms. Dhupia looked fantastic! Meanwhile popular designers Rocky S, Masaba and Gaurang Shah presenting their collection amidst high octane musical performances by Nakash Aziz, Mika Singh and Aditi Singh Sharma. Bollywood celebs turned showstoppers as audiences tapped their feet to popular Bollywood beats like Gandi Baat, Tu Mera Hero, Party All Night and Dhoom Machale. Aditi Rao Hydari walked the ramp for Masaba’s fusion collection. The black cut-out mermaid dress featured a glittering drape that was made to resemble a sari fall. It was then clinched at the waist with a slim belt for added effect. Aditi’s sleek styling consisted of a straight middle parted hair and barely there make-up, with just a dash of orange red on the lips. The other celeb who walked for Masaba was Malaika Arora Khan. Her outfit was a black two piece featuring quirky gold tone detailing. Going for no accessories and minimal make-up, a high ponytail completed Malaika’s look. The showstopper for designer Rocky S was Dia Mirza who shimmered and dazzled in a glitzy sequined silver gown. Dia’s hair was given a retro look and so was her make-up. When its Rocky S we’re talking about, can we ever forget Bipasha Basu who has played muse to the designer umpteen times? Bipasha sashayed down the ramp in a flapper dress inspired number, reminiscent of the roaring 20s. Her exaggerated voluminous hair and bold lips further added to the appeal. Moving away from Masaba’s fusion concept and Rocky S’s retro western collection, Gaurang Shah kept his theme on traditional Indian crafts and fabric. 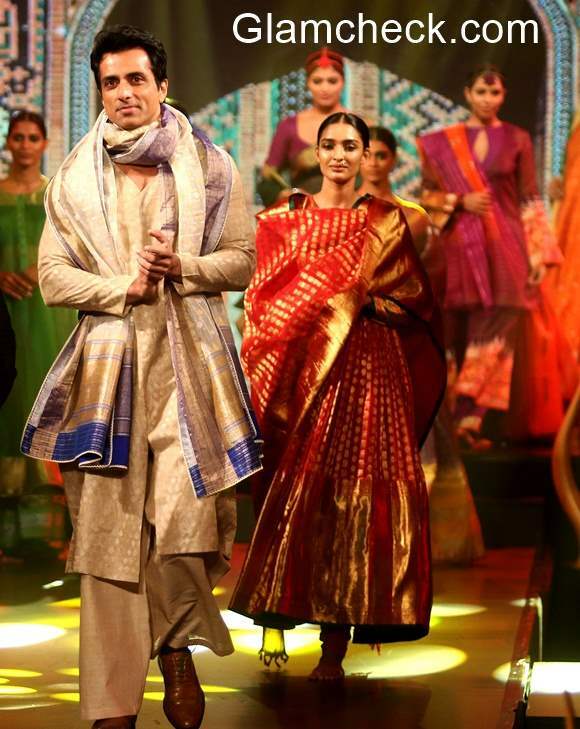 Gaurang chose actor Sonu Sood to be the showstopper for his collection entitle ‘Umrao’. Sood was dressed in an ivory colored ethnic suit with a rich shawl draped around his neck. The combination of fashion and Bollywood indeed made for a spectacular evening.